The cucumbers just keep on a-coming. So too then will the cucumber recipes. I try to steer away from sugary juices and sodas but, with this heat, a cooling drink of some sort is a necessity. Of course, there’s always water. But if you’re in the mood for something a little jazzier, I suggest a refreshing glass of cucumber water. Sometimes I keep it simple and just add cucumber slices to water and pour over ice. Other times, I doctor up my cucumber water with some lime and mint. I’ve got lemon cucumbers on hand this week so they went straight in. However, feel free to make this with any type of cucumber you happen to have in the fridge. Slice off the ends of the cucumber and, using a peeler, remove strips of the skin so that you have alternating strips of bare cucumber and cucumber with skin. Slice the cucumber into rounds and place in a large pitcher. Add the lime juice, lime slices, and water. Refrigerate for at least 1 hour for the flavors to infuse. 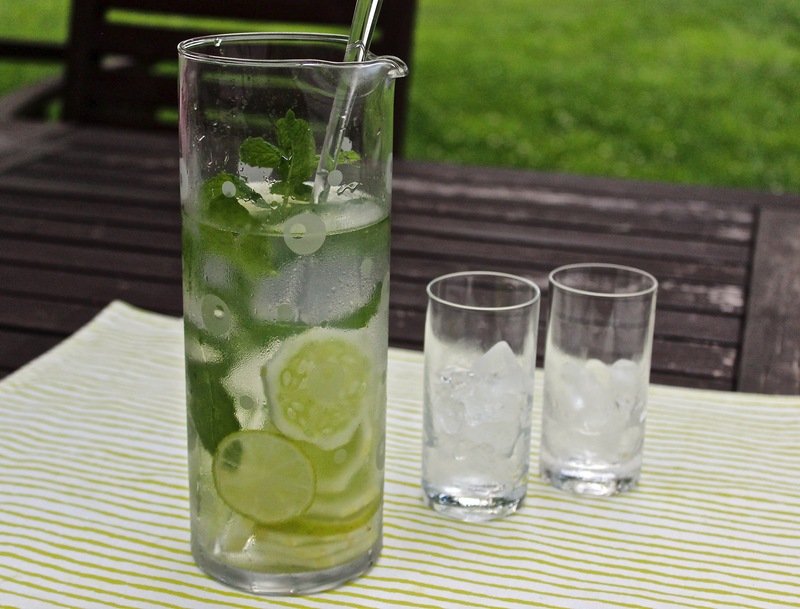 Serve with mint sprigs over ice. This entry was posted in beverage and tagged beverage, cucumber, drink, lime juice, mint. Bookmark the permalink.